The final installment of our five basic joint locking, pain inducing come alongs is here! 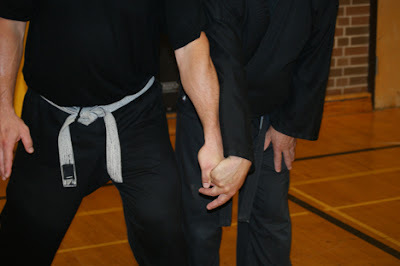 First of all, I suggest that you practise this technique by approaching your partner from the rear. The advantage here is that you simply follow a straight line, making the learning of this technique a little less complicated. An approach from the rear also has an element of surprise. In fact, for the bad guy who thinks his girlfriend has just slipped her hand in his and who doesn’t bother to look around to make sure, the result can be quite a shock. 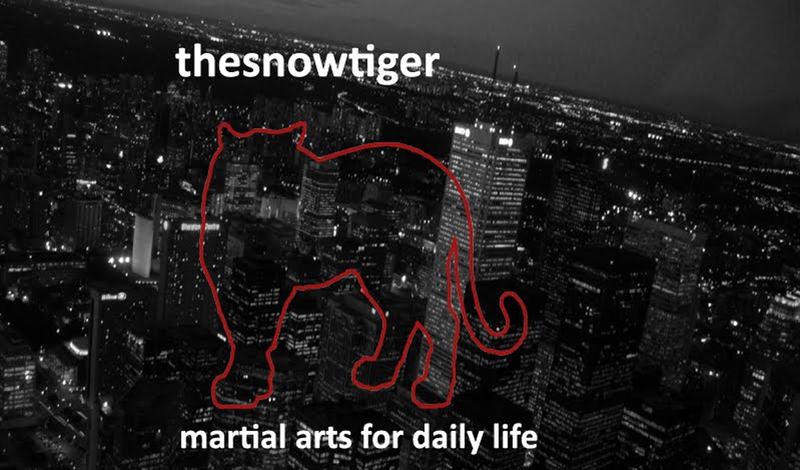 Professional martial arts instructor Sensei/Sifu Terry Langevin is back with us along with Sensei Murray Mahoney (the man who is always smiling, even while in the depths of pain). 1. Langevin approaches Mahoney’s right side from the rear or from the side. He grasps Mahoney’s right hand by the ring finger and the little finger with his left hand. At the same time, he strikes or pushes the right side of Mahoney’s head. 2. Langevin now does two things at once – still holding onto Mahoney’s fingers, he wraps his left elbow over Mahoney’s right arm (a counter-clockwise movement) while at the same time grasping Mahoney’s arm from below and pulling it toward him. Langevin adds quite a bit of verve to this hand/wrist/arm lock by dropping his left elbow down in the gap between the right side of Mahoney’s torso and arm. 3. Still holding on to Mahoney’s fingers, Langevin grasps Mahoney’s thumb with his right hand, twisting it downward. That’s when the more seasoned individuals in the class step back, shaking their heads gently and smiling. Watching a technique done is one POV. Feeling a technique done, and collapsing under the pain, is a more excruciating – and valuable – lesson. I venture to guess that most of us have done the same at least once! 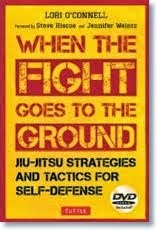 Please don’t forget: all techniques must be applicable 360 degrees in a variety of situations within the flexibility demanded by combat. 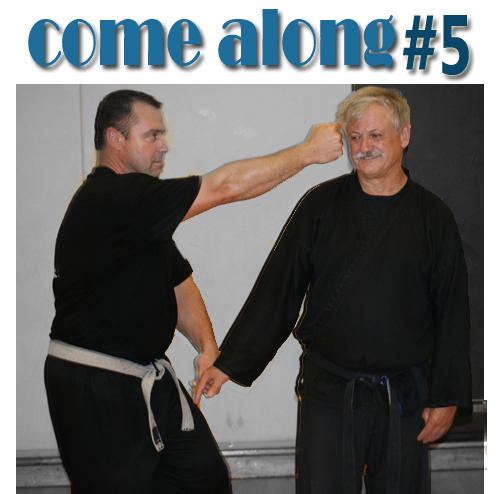 In last night’s class, we were using the five basic come alongs against a variety of attacks. For example, an uke would apply a choke from the back. 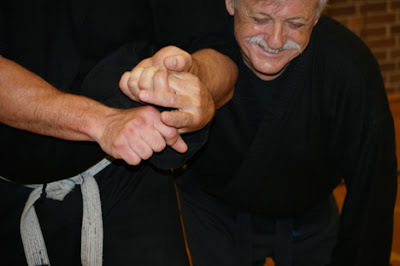 The defender would have to strike or stomp the uke several times, turn and then apply a come along which might then be followed by a take down or throw. 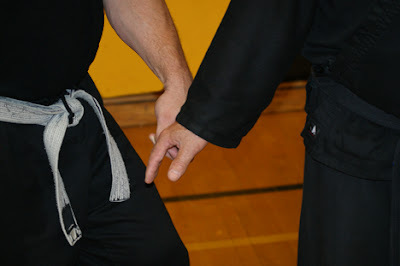 Thank you Sensei/Sifu Langevin and Sensei Mahoney. 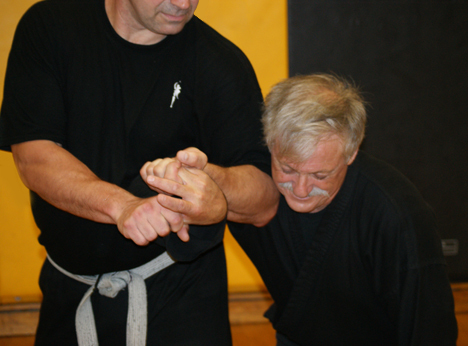 Terry Langevin teaches a variety of martial arts from Karate, Jiu Jitsu, Grappling, Tai Chi, Chi Kung to basic and advanced Self Defense. He is deeply admired by his students and by other instructors for his skill and more importantly, for his kind and caring attitude. He does enjoy travelling, so if you’d like to invite an instructor to your club who is honest and friendly and who doesn’t put other people down, contact this man at 613 478 5173 or at 2terrylangevin@gmail.com.